Yes I thought it was you Chubsta, but lazily didn't look back before typing. Newts do eat taddies I believe, but I've not seen this myself. I have spent many an hour watching taddies swimming about and newts ignoring them. That's not to say they won't eat them though! 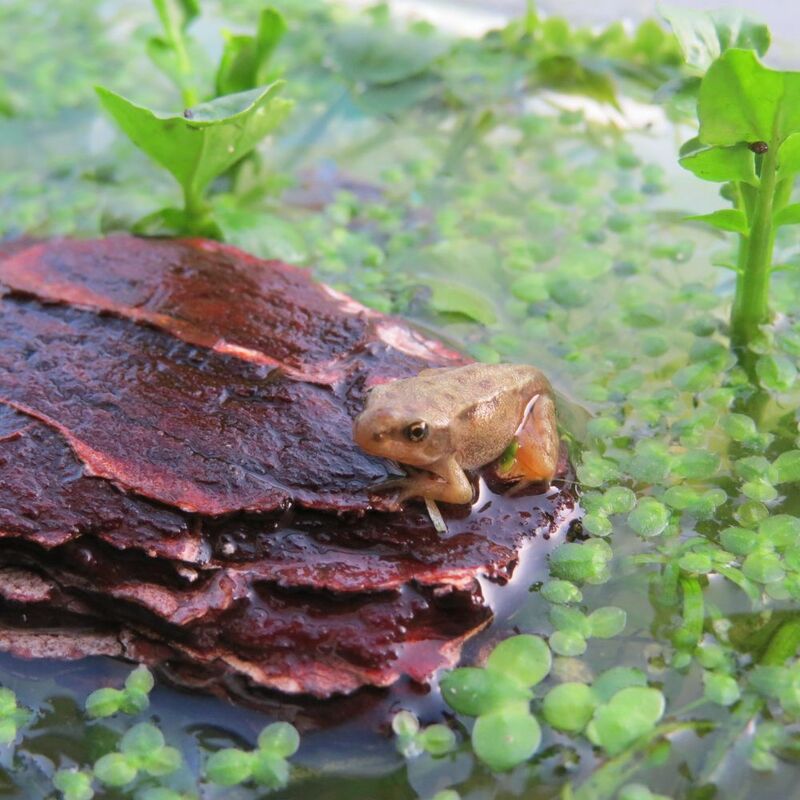 I did once find a palmate in the centre of a clump of spawn when I netted it out of the pond to hatch elsewhere. Maybe my palmates are a smallish newt to tackle the taddies once they put some weight on. If the water isn't clear enough to tell, i wouldn't give up hope yet Gemma. A few years ago all the spawn in one of my ponds disappeared shortly before i went away for 3 weeks. When i returned - to my delight - it was teeming with tadpoles. Personally, i would have 'farmed' some spawn as insurance though. I completely understand why you and Suzy would adopt let-nature-take-it's-course, non-intervention stance, but humans have made these such difficult times for our herps that i don't see any harm in giving them a little 'leg up' here and there. In addition to the 15 tadpoles (which now have hind legs) on my kitchen windowsill, i put some spawn (now small but free-swimming tads) in a huge aquarium that's standing near the pond in the garden. During the past week, 8 newts (all males) have scaled the 45 cm glass, negotiated the large, overhanging 'lip' at the apex, and dropped inside. Ben, aren't there restaurants where you can look in the tank and choose which fish/lobster you want to be cooked for you to eat? Maybe your newts are doing the same but getting in the tank to choose! That is if they eat tadpoles. I just felt that it was such a lot of work tadpole rearing when things could go wrong and maybe they'd have fared better on their own. Some years I had brilliant success, others not so. Suzy - I feel the same about hedgehogs - the main 'carer' for the rescue wants to get every hog in that anyone sees, if only to give a it a once over and check for lungworm etc, whereas I am very much of the opinion we should let them live their lives naturally and only intervene if we identify there is a problem, of course by then it may be too late. There are positive and negatives to both options. 'Interfering in nature' by helping animals long, such as the tadpoles, puts them at other risks but as ben has said, we have already had a negative impact on them as humans anyway so perhaps we have a responsibility to help them if we can. The spawn that I moved into my new small pond (one clump) as mentioned previously is doing well. In fact I can't believe how fast the taddies are growing. Certainly growing more quickly than ones in containers I've reared. They are not so crowded (even though I tried to spread captive taddies over many containers) and no problems with water overheating, which I had with containers if they got more than a few hours sun. In fact they are loving all the sunlight (when we have any) and the natural food in the pond must agree too. I specifically got this small pond hoping it would be good for frog spawn rearing, and so far it is. I think we all do hand rearing to give species the best chances, when perhaps on their own the conditions might not be so good. However for whatever we're rearing it takes a level of commitment and understanding and still things can go wrong. Nature allows for high mortality, but it is hard sometimes to step back and let nature take its course. You're right of course Suzi, but in a way we've intervened from the off by digging our ponds, excluding fish and generally encouraging - effectively farming - frogs in the first place. It's still a long way from manipulating weather, IVF, GM crops, Gene Editing and attempting to reanimate dead pig's brains though eh? I've seen newts voraciously chase and devour young frog tadpoles, and they will also gladly eat the egg 'dots' (but not the jelly) in the centre of freshly-laid frogs spawn. As the tadpoles grow though, they become a bit unwieldy. In a fabulously busy and perfectly clear (yesss!!) amphibian pond (common frog, common toad, smooth newt and palmate newt easily observed) on a local nature reserve last week, i watched a male smooth newt chase, gobble - and swallow - a toad tadpole too. That was something i hadn't expected since a lot of predators leave those alone, finding them distasteful. Have seen fish for example, snap them up but within seconds they spit them back out again. I remember reading once that some grass snakes will eat toads. Does Will, Gemma, Caleb or anyone know if there's a similar story of limited newt predation of toad tadpoles then, or do they all happily consume them (and i just haven't seen it happen before)? Proudly presenting my first 'hand-reared' 2019 froglet!